Born in 1959 we decided to move from The Netherlands to the Alentejo 3 years ago. We hope to receive you on our quinta as our guests. When we purchased our Quinta, we had an idea of what we wanted our property to become. We planned to retain much of the original layout of the limestone rich land that at one time was covered by 4 hectare of vineyards, and the lush area near the creek that originates in the Sao Mamede hills. We found the upper area suitable for the swimming pool and deck chairs, and it fit beautifully into the surroundings. At the south side of the property is an enormous granite formation, and we made sure to preserve the hundreds of olive trees, eucalyptus trees, cork oaks and old stone oaks with their mighty branches. A rustic path going by these areas, is in the planning, and we expect to install benches for scenic sunrise or sunset panoramas, or to view the illuminated chapel “Senhora de Penha. The bathroom is a separate wellness space in itself, and has a surprising view of the night sky. 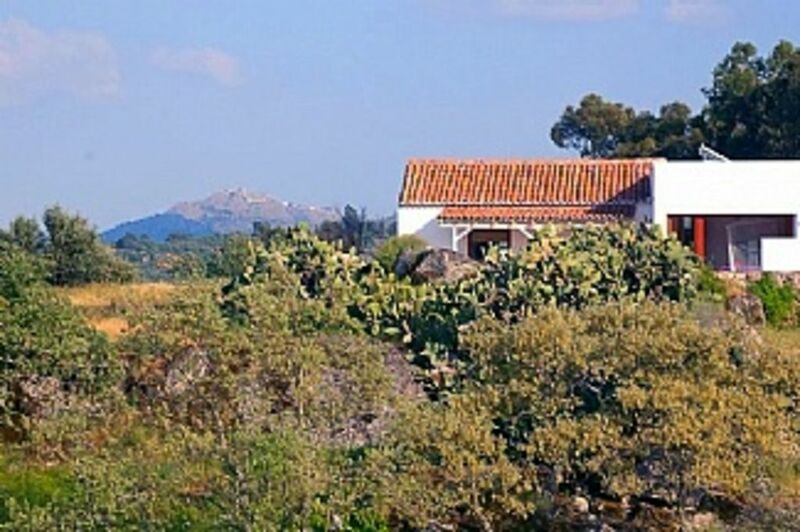 Outside: The total premises is 10 ha and knows a lush area near the creek that originates in the Sao Mamede hills. We found the upper area suitable for the C-formed shared swimming pool with the easy chairs, and it fit beautifully into the surroundings. At the south side of the property is an enormous granite formation, and we made sure to preserve the hundreds of olive trees, eucalyptus trees, cork oaks and old stone oaks with their mighty branches. A rustic path going by these areas, is in the planning, and we expect to install benches for scenic sunrise or sunset panoramas, or to view the illuminated chapel “Senhora de Penha. Tha casa itself has a big terrace with outdoor furniture to enjoy the morning and evening sun. Cleaning / Towels / Linen / Maid service: Towels and linen are included, towels and linen are changed twice a week. Other: The living room is extended with a spacious adega with furniture to enjoy the warm evenings. You can also take painting and drawing lessons at our Quinta. An introductory lesson of 3 hours, including materials and a drink is 45 Euro. Barbara Walraven lives and works close by. Born in Buenos Aires, she studied at the Art University of Tilburg and Breda. Many art lovers both in the Netherlands and Portugal have been able to enjoy her exhibits. Take this opportunity to foster your creative side. Excursions are possible to artesanal producers of local products like regional cakes, smoked ham and sausages. Or pottery, embroidery, chestnutbaskets. A chance to look inside a unique world of very old traditions. Exclusively for our guests. The distance to the coast is driving 1 hours and 45 minutes. One can also enjoy the rivers, like the Tejo and Sever, and the many lakes in the area, starting at 20 minutes driving. The closest airport is Lisboa Portela Airport. All national airliners fly daily to and from Lisbon. The national Portugese airliner is TAP. Other options are the airports of Porto in the north and Faro in the south of Portugal. Budget airliners brings you to these destinations at interesting rates. You may visit these towns before discovering other parts of Portugal. Useful are the good train and/or metro connections. We recommend to hire a car. Castelo De Vide is the closest town at 2.5km and is a 30 minute walk from our Quinta. The Burgo Medieval, inside the castle walls, has narrow streets, and houses a museum as well as the Igreja Senhora de Alegria. Nearby, there is the Judaria and a historically important synagogue. Our Quinta is located in the Alentejo, which is within the borders of the National Park Serra de Sao Mamade, near the border to Spain. Alentejo means the land on the other side of the Tejo (Tague) river. This area is known for its vineyards, olive groves, granite rock formations, and hilly landscape. Visitors to the many local castles are rewarded with beautiful views, and one can explore the many villages hidden in the hills. One can also enjoy the rivers, like the Tejo and Sever, and the many lakes in the area. If you want enjoy the atmosphere of some of the larger towns, the neighboring Spanish towns of Badajoz and Cacares are about an hour drive. You can expect that your vacation will be special, since there are many ways to enjoy the area. Whether you hike, bike, drive, motorcycle or paddle a kayak, you will appreciate the local fauna and flora. Booking Notes: payment 50% at booking and 50% upon arrival. Changeover Day: Flexible changeover day, preferably on saturday. Check in from 3 until 9 pm. Check out time before 12 noon.